The shadowy depths of the primeval forest are the ancient source of our collective fears. But there's worse things in the woods than timber wolves and picnicking teddy bears: a traveller could lose, not just their way, but their mind as well. 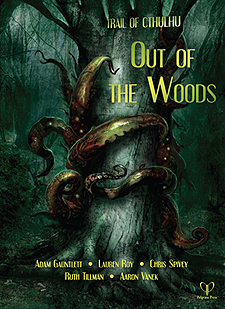 These five new scenarios for the Trail of Cthulhu RPG explore the hidden groves of unnatural trees, and the dark, endless canopies, that comprise the hideous soul of Lovecraft's forest. MIDNIGHT SUB ROSA: The diary of Ezekiel de la Poer, a colonial-era necromancer hanged for child-murder in 1736, was stolen from the home of an emeritus professor in the caves of a forest of white ash. Can the Investigators find the book before its thief becomes something beyond human? THE SILENCE MILL: In a small village in Brittany, close to the Arthurian forest of Broccliande, a friend of the Investigators stands accused of serial murder, cannibalism - even lycanthropy. Can they find the truth? Or will the truth find them? DREAMING OF A BETTER TOMORROW FOR 30 DOLLARS A MONTH: Amongst the crowded green precipices and muttering forest streams of Vermont, labourers disappear from, one of Roosevelt's integrated Civilian conservation Corps camps. In an atmosphere fraught with political intrigue and the spectre of Jim Crow, can a racially diverse band of Investigators find the primordial horror responsible? THE COLDEST WALK: Deep in Wisconsin's northern woods lies the town of four Pines - a quiet, almost forgettable community. But whenever the aurora flashes in the sky, the inhabitants must make a terrible choice. Can the Investigators stop the inevitable, or must they take the Walk for themselves? THE TREMBLING GIANT: In 1937, the United States government transferred 300 acres to the newly recognized Koosharem Band of Paiute Indians. But this new land is throttled by distorted trees and stalked by unnatural beasts. Nightmares grip the shaman, and warning totems shatter - what is the legacy of this ancient land, and can the tribesfolk fight this ancient evil? Containing extensive handouts, maps and pre-generated characters for each adventure, Out of the woods takes your hand and leads you gently through the caves - and into the darkness. ... YOU'RE IN FOR A BIG SURPRISE!